In a world already packed with devices that need to be recharged or plugin in, this wire-and-battery-free switch saves some trouble and turns the energy of the user’s own motion into its own unlimited power source. Developed by Panosonic, the switch generates power through users and can trigger anything around you from lights and fans to computers and music players. Imagine walking into a room or sitting down at your desk and having your devices and lamps turn on around you all automatically. 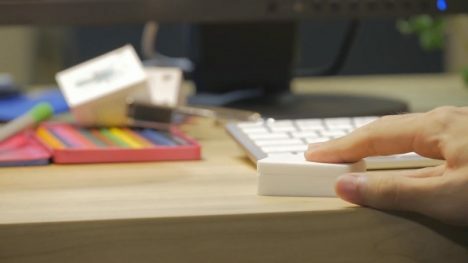 Additional functions can be activated by physically tapping the switch but moving it is not essential – even ambient surrounding activity can charge the device, like opening doors or jostling surfaces. Easy setup and installation are possible thanks to the lack of wiring and while the device is a prototype it can presumably be programmed to various functions in time and on demand. See more in Various Gizmos or under Gadgets. November, 2016.